Industry experts say that every house, building, business, etc needs concrete work as much as twice in every ten years. Those jobs usually need something less than the nine yards that a barrel truck delivers. If you had to take a full nine yards, you would have to pay too much and there would be waste. However, there are a number of valuable additional reasons. For example, if you need one of the following, you may have to use a short load concrete supplier. The following are typical jobs which call for a short load concrete service company. You can just call and order as much or as little concrete as you need. The mobile concrete mixing truck shows up and starts making concrete as you need it. You are freed up from picking up the bags of concrete and probably a mixer too. You don't have to call on family and friends to help you mix the concrete, haul the heavy bags of concrete and clean up. Consequently, you don't have the payback problem of owing them the favor of helping them with their projects. When the concrete is poured and you have all you need, the machine simply stops making concrete. All the raw materials that weren't used, stay on the truck. You don't have to clean up the equipment or return unused concrete or bury excess concrete. There is no wasted concrete dumped at the job site. The truck just drives away. 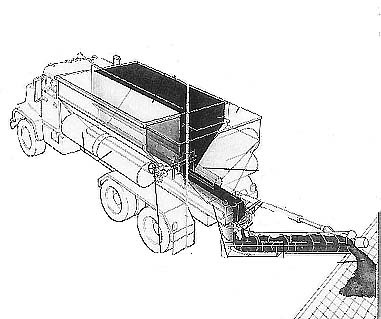 The short load concrete truck carries separate bins which hold gray powder cement, aggregate and water. As you need concrete, an auger on the concrete delivery truck mixes the components as they come out of the truck. The operator can control the amount of water. The operator has precise control of how much concrete is made. In addition, the operator can add other ingredients to make the concrete harder, such as a fiber mesh. Some trucks have the ability to add color, to make colored concrete patios. By controlling the amount of water, the operator can control the "slump", which is important when the concrete is sloped. If the concrete is too runny, it will run down hill and out of the form. If the slump is just right, the concrete will stay on an incline. We have no members of Short Load Concrete Companies of America in this area. If you are a Short Load Concrete Company and would like to be listed here, either call David Murray at 800-239-3814 or click the link below.